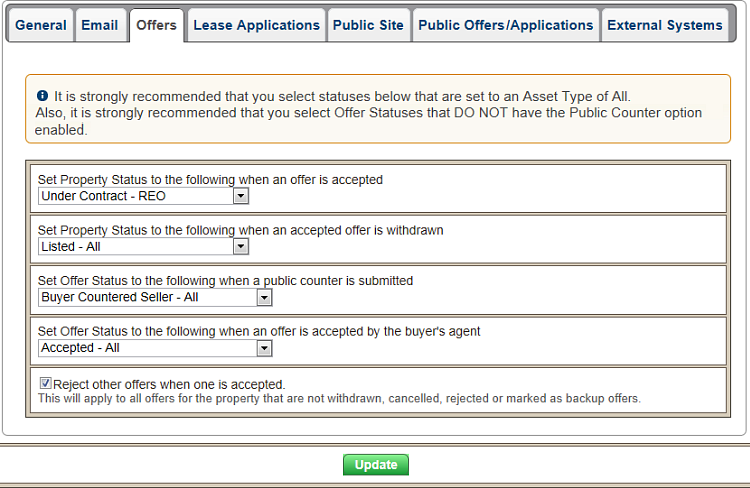 The Offers screen is where you can determine how Broker Brain sets property statuses when offers are accepted or withdrawn. 1. From the Admin tab, click the Site Settings sub tab on the left-hand side of the screen. Click the Offers sub tab (at right). 2. Make your changes, then click the Submit button to save your information. Note: Each tab within Site Settings has its own Submit button, so it is necessary to click Submit at the bottom of each tab before making changes on another. See below for screen shots and details on how to complete each field. Set Property Status to the following when an offer is accepted - This function sets the default property status when an offer is accepted on the property. Set Property Status to the following when an accepted offer is withdrawn - This function sets the default property status when an accepted offer has been withdrawn. Set Offer Status to the following when a public counter is submitted - If you are setting up the system to allow counter offers via the public site, indicate here which status an offer should default to when a counter offer is submitted. It is strongly suggested that you select an offer status with an Asset Type of All. In order to prevent multiple counter offers from being submitted, it is very important that you set this field to a status that does not have it's public counter feature turned on (this is set up in Admin>Statuses>Offer). If you select a status with the public counter turned on, the Counter Offer Request shown on the public site continues to display even after counter offers are submitted, and new offers can continue to be received. Set Offer Status to the following when an offer is accepted by the buyer's agent - If you are setting up the system to allow counter offers via the public site, this field allows you to specify which status the offer should default to when the buyer's agent accepts a seller's counter offer. The status selected should indicate that the agent has accepted the counter. Again, it is strongly suggested that the offer status you select has an Asset Type of All. Reject other offers when one is accepted - Checking this box will have the effect of setting all existing offers on a property to a status of Rejected when one offer is accepted.